Celebrity Holiday Author Meet and Greet Just in time for the holiday season, meet various local authors, peruse their books, and perhaps purchase a copy- or two. Complimentary hot cocoa and snacks guaranteed to make spirits bright. Winner of the Art and Literary Award from the New York State Outdoor Education Association (NYSOEA). 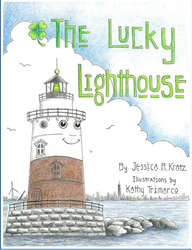 On Saturday December 9 at 1:30pm at the Greenbelt Nature Center, 700 Rockland Avenue Staten Island NY 10314, join Jessica R. Kratz (The Lucky Lighthouse, Boulevard Books, 2016) and handful of local authors at the Greenbelt’s first-ever Holiday Author Meet and Greet. There will be complimentary hot cocoa and snacks guaranteed to make spirits bright, an opportunity to win door prizes, and a great cross section of books in various genres. From short stories to children’s books to haunted history, there is something for everyone. Chosen as the 2016 Best Artist- Written in the Staten Island Advance Readers’ Choice poll, Jessica also recently received the Art and Literary Award at the 2017 New York State Outdoor Education Association annual conference. The Holiday Author Meet and Greet is an opportunity to pay it forward, to introduce the community to the authors in their neighborhood, and for the authors to engage with current readers—and meet new ones. Hopefully, some visitors will “shop small” this holiday season and purchase books from the authors and/or gifts from the nature center gift shop.